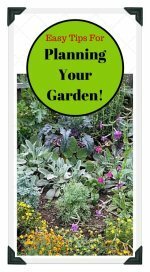 Are you looking for container garden plans, tips, and designs for vegetable gardening in small spaces? You have come to the best place to learn how to plant a vegetable garden in containers! We have also created a short video to help inspire some container ideas to help you get started. Every gardener wants to give his or her plants as much of a head start as possible, while saving money at the same time. This is what makes following traditional vegetable gardening tips so invaluable. We have container garden ideas to share that are designed to save considerable energy and keep more green in your pockets. Wicker baskets are excellent lightweight containers. Line the inside with moss or plastic bags to retain moisture. Old barrels make great tubs for growing potatoes or strawberries, especially in limited space vegetable gardens. If you are searching for plant containers, there are many recyclable shabby chic options available. 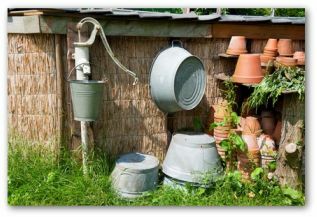 Broken trashcans, old buckets, or empty food cans make good pots for plants as long as there are holes in the bottom for drainage. Line the base with a few stones or a handful of gravel to prevent the drainage holes from clogging. Since metal conducts heat and cold efficiently, plants in metal containers could burn in summer and freeze during winter. After ensuring adequate drainage, line the container with plastic such as bubble wrap to insulate the roots from being burned. 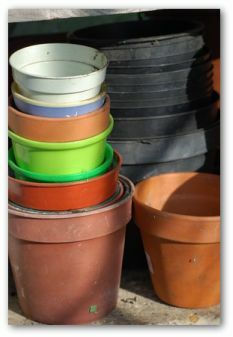 Clay and ceramic pots are often used in container gardens. At the end of the garden season, be sure to empty the pots for storage to prevent freezing and cracking during the cold winter months. This is a lesson that I learned the hard way, and re-learned the hard way again this year! Vegetable plants growing in a container garden cannot get everything they need from the soil, so feed them regularly with liquid fertilizer. 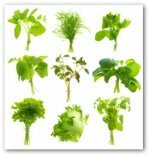 It should come to no surprise what a critical chore watering is in the vegetable garden as plants are composed of about 90 percent water. For slow-release watering in a hanging basket or container, place six to ten ice cubes on the potting soil, underneath the foliage. Plants grown in a container garden need more moisture than vegetables growing in the soil. In containers, the plants' roots are restricted, as there is a high ratio of root to soil, and soil in pots tends to dry out fast. A good container garden idea is to soak baskets twice daily during hot summer weather. 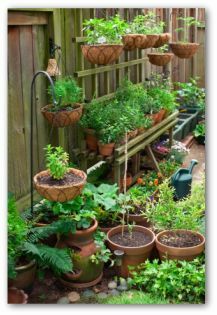 In most cases, a watering can is all you need for a container garden. There is an old saying that goes, "tomatoes and cucumbers need water quite warm". Many gardeners still follow this practical advice.Some believe that all plants should never be watered with very cold water because it is a shock to their system. When using recycled pots for your container garden, wash them out in a bath of nine parts water to one part bleach. This will sterilize the pots and prevent plant diseases from spreading. 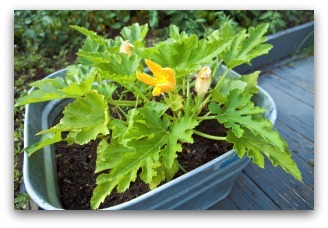 What Vegetables Grow in Container Gardens? Basically, almost any vegetable can be grown in a container garden. Even watermelons can be successfully cultivated on sunny decks in redwood boxes. Each box measuring 18 inches by 14 inches and 16 inches deep could hold melon plants. 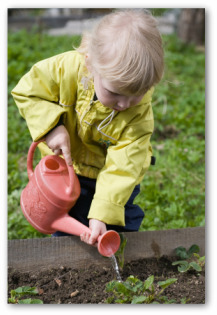 Every time the plants are watered, add a half teaspoon of 20-20-20 fertilizer to a gallon of water. 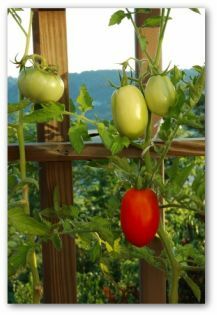 Tomatoes are well suited to growing in containers. A tomato plant of standard sized variety will need several gallons of potting soil. The small-fruited varieties such as cherry tomatoes, are sometimes grown in hanging baskets. An 8 to 10 inch pot would be about the right size for the smaller tomatoes. Eggplant and peppers are also good container garden plants. If you have ample space for a good-sized planter, they are an efficient way to have your vegetables and eat them too! Planters are excellent container garden ideas for growing a miniature vegetable garden. Place the planter in the sunniest spot possible. Dimensions of the box can vary to your specifications but a depth of a minimum of 8 inches is important. Boxes that are 12 to 15 inches deep would be ideal. The width can be from 18 to 36 inches and the length as great as your space permits.